CONCORD, N.C. - Kevin Harvick's 2018 tour de force continued in America's heartland Saturday night as he scored his fifth win of the season in the KC Masterpiece 400 at Kansas Speedway. The 2014 Cup Series champion started on the pole Saturday and ran in the top three virtually the entire race. Since joining SHR, Harvick has been nearly untouchable at Kansas. In nine starts, Harvick has finished outside the top 8 just twice and has two wins to go along with an average finish of 5.2. Harvick is the first driver to win five of the first 12 races in a season since Jeff Gordon accomplished the feat in 1997. Gordon finished that season with 10 wins and his second championship. 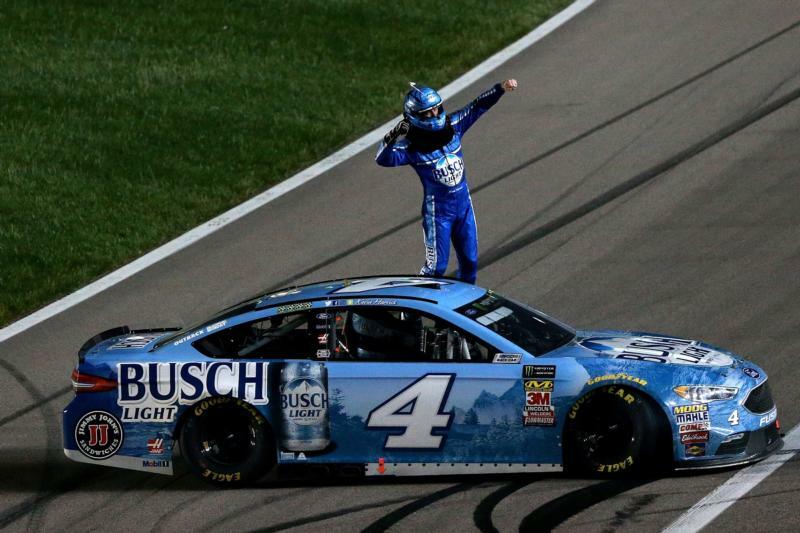 Harvick is halfway to becoming the first driver to hit double-digit wins since Jimmie Johnson did so in 2007. Only twice in the last 30 years has a driver won at least 10 races and not brought home the championship (Rusty Wallace, 1993, and Jeff Gordon, 1996). "Now it feels like a game," Harvick said after the race. "Because of the fact that you want to see how many races you can win. You want to see how many laps you can lead. We know that we're riding a momentum wave that is hard to come by, and you need to capitalize on it as many times as you can because it may never come again." How Harvick won the race: Following a violent multi-car crash in Turn 4, Harvick and several leaders chose to pit for fresh rubber despite having just a few laps on their tires. With the laps winding down, Harvick got to second, but was seemingly unable to close in on Martin Truex Jr.'s back bumper. Knowing he was running out of time, Harvick moved up the track and got around the 78 coming to the white flag and ran away with the win. "He was getting smaller, and I was like, 'I've got to do something different, this isn't working,'" Harvick explained. "I've got five laps to go, I'm going to drive it in here, and I'm either going to hit the wall or it's going to turn. "… Those are the moments that you just kind of throw caution to the wind, see what happens, and it all worked out." Paging Jimmie Johnson: Jimmie Johnson's woeful 2018 season continued at Kansas with a ho-hum 19th-place finish. After qualifying mid-pack, Johnson worked his way up to the top 15 before making an unscheduled stop for a loose wheel in the first stage. Johnson took the blame for the problem, saying his foot slipped off the clutch, making it impossible for the rear tire changer to get the lug nuts tight. The 48 lost a second lap to the leaders at the conclusion of Stage 2, all but ending their hopes of a solid finish, and extended Jimmie's winless drought to a career-long 34 races. To put this race in perspective, it was the first time in 24 starts that Johnson's ever finished off the lead lap in Kansas during a race he wasn't involved in an accident. All season long, Jimmie's channeled his inner Babe Ruth with motivational quotes. Now, he's calling on another baseball icon to break out of this slump. Willy B's wild ride: William Byron was thanking his lucky stars after walking away from a terrifying crash late in Saturday's race. Byron found himself near the front after a two-tire stop, and as the field exited Turn 4, the air sucked his No. 24 around in the middle of a four-wide group, triggering a huge pileup. As Byron tried to gain control of his machine, he caught the left-rear corner of Clint Bowyer and slid into Ryan Newman, sending him head-on into the outside wall. Byron's car flew into the air and went up in flames as he landed on Newman's hood before coming to rest along the infield grass. We're happy to say that Byron — and everyone else involved in the crash — was able to walk away safe and without injury. Kenseth's forgettable return: All eyes were on Roush Fenway Racing's No. 6 with the return of 2003 Cup champion Matt Kenseth. Unfortunately for Kenseth, it was a return he'd like to forget. After failing to make a lap in qualifying due to inspection troubles, Kenseth found himself a lap down in the first 30 laps. After taking the free pass, Kenseth again lost a lap before the conclusion of Stage 1. Unable to get out of the mid-20s, Kenseth's night crashed to a halt when he was caught up in the multi-car crash with William Byron and others. "I don't have any idea what happened with the wreck," Kenseth said. "I just saw everybody wrecking and the track was kind of blocked, so I tried to get down towards the grass. This grass is not the new friendly grass with the rain and all it just kind of dug in and then I hit the car in front of me." If nothing else, Kenseth had some valuable seat time and has some feedback before this weekend's All-Star Race. Penalty looming? It's been a season full of midweek penalties for rear window infractions. From Kevin Harvick's Las Vegas penalty to Clint Bowyer's violation at Dover, we've seen multiple penalties for teams pushing the envelope with rear window braces. Kyle Larson and Chip Ganassi Racing could be the next team to face NASCAR's wrath after Kansas. Following Saturday night's race, the rear window of Larson's No. 42 was buckled quite severely, and a NASCAR official was standing nearby to make sure no one messed with the car before post-race inspection. Larson believes the damage came from a collision with Ryan Blaney earlier in the race. His left-rear quarter panel was banged in pretty bad from their run-in. NASCAR brought Larson's car back to the R&D Center in Concord, N.C. for further inspection and no decision has yet been made as to whether he'll be penalized. Stay tuned, as NASCAR penalties are typically announced on Wednesdays. Did you see that? On the cooldown lap, Chase Elliott appeared to take out some frustration with Ricky Stenhouse Jr., giving the driver of the 17 car a pretty big shove in Turn 3. Stenhouse responded by slamming Elliott's door. Afterwards, Elliott stormed down pit road and confronted Stenhouse over what looked like a late block in the closing laps. Fortunately, cooler heads prevailed and no punches were thrown. Chase Elliott and Ricky Stenhouse Jr. were not happy with each other after the finish at @KansasSpeedway. ?? Gone but not forgotten: For the NASCAR world, Saturday marked the 18th anniversary of one of the sport's darkest days. On May 12, 2000, fourth-generation racer Adam Petty lost his life in a practice crash at New Hampshire. On Saturday, droves of NASCAR personalities past and present shared memories of Adam on Twitter, and his father Kyle shared a precious gift he received from Victory Junction at the conclusion of his Kyle Petty Charity Ride. Social Media Spotlight: As has become a tradition in NASCAR, the spring race at Kansas is run on Saturday night so everyone can get back home for Mother's Day. There's no love quite like that between a mother and her children, and several NASCAR drivers and personalities are celebrating for the first time, including Amy and Dale Earnhardt Jr., who shared this adorable photo with newborn daughter Isla Rose. Very special Mother's Day this year with Isla in our lives! We couldn't love her more. Wishing all the other Momma’s a wonderful day! The Loganos also enjoyed Mother's Day for the first time as a trio, with Joey sharing a photo of his son and wife Brittany, or as he lovingly referred to her, "Hudson's Hot Mama." And we'd like to take a second to mention Fast Talk co-host Kyle Petty, who shared a great family photo of himself alongside his sisters and wife Morgan, who is expected to give birth to their first child soon. Bloomin' Monday: For the tenth time in a dozen tries, Outback will be giving away Bloomin' Onions all day long Monday! Every time Kevin Harvick finishes in the top 10, you win at Outback, so stop in and tell your server you're there for Bloomin' Monday and they'll bring one to your table for free! Next week: The NASCAR circuit will enjoy the first of two "home" weekends at Charlotte Motor Speedway with the Monster Energy NASCAR All-Star Race. The action gets started with All-Star qualifying that includes a live pit stop on Friday. Three drivers will reach the feature by advancing from the All-Star Open and then it's 80 laps, four segments for $1 million. Oh, and have we mentioned to new restrictor plate and aero package being used for the race? You won't want to miss it!